When an email from Taste of Ayrshire popped into my in-box in the middle of July, I jumped at the chance to meet up with other bloggers and learn more about the craft of blogging. There was very little information about the programme, but I booked up anyway then got straight on to Twitter to let the blogging community know. I'm not sure how many people were sent the email but I do know that there was a bit of a ripple effect from my tweets which reached Jacqueline at Tinned Tomatoes, Louise at Please Do Not Feed the Animals, Stuart at Mr CakeyBoi and Kellie at Food to Glow. It's always a pleasure to meet up with Jacqueline from Tinned Tomatoes (on the right) more photos of food bloggers in my next post, but as there is a lot of information to share, I am splitting this into 'chapters' expect 'lashings of ginger beer!'. Our first speaker was Justin Galea, the Executive Chef at the Turnberry Hotel. Justin is passionate about food and talked about three important aspects of showcase food: sustainability, seasonality and ethical purchasing. He is able to buy excellent game, beef and vegetables from the local area around the hotel. He also has access to fresh fish landed at Girvan and quality seafood from the island of Arran on his door stop. 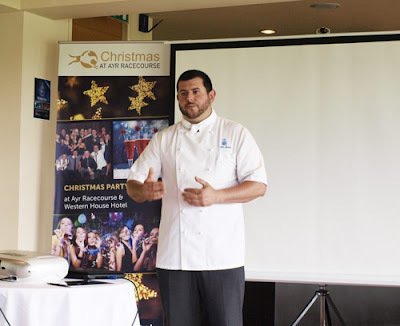 Justin told us the story of a diner who asked for an asparagus omelette out of season and how he is prepared to 'say no' to customers on the grounds of seasonality, if the product is not in season it won't be on the menu. Sustainability is only one aspect though, buying locally is only sustainable if the product is good and ethically produced. There were more tales of local suppliers, some of whom were artisan producers farming using organic methods, but unable to get the accreditation. As long as he was satisfied with that the production was of the highest quality and ethically produced he was willing to pay a premium. Buying high quality produce locally means that the carbon footprint and environmental impact of the Hotel resort stays low. It was news to me that the majority of foraged food for the top 50 restaurants comes from Scotland. Justin is fortunate enough to be able to walk 200 yards from his kitchen into the woods behind the hotel and forage for ingredients which reach high prices in the markets in London. Justin then moved on to talk about value for money. The Turnberry Hotel is an expensive place to eat, but from Justin's point of view, value for money is about the enjoyment received for the price paid, walking away with an experience. I would agree, but would be unlikely to be prepared to pay £600 for a dinner for two! We were also guided as to how to identify a good chef. Justin recommended quizzing the waiters, they should be able to tell you everything about the dish you have ordered. Ask the name of the farmer who produced the main ingredient, and for meat like beef, ask whether it is grass fed or grain fed. Was the fish farmed or line caught? In a nutshell "Where has it come from and why?" One of the questions asked of Justin was "who influences you and who do you follow online?" The answer was an interesting one as Justin has been following his food heros, such as Alain Bourdin, since he was 10 years old, when there was no Facebook, LinkedIn or Twitter. He 'follows' them wherever he can find them, but also recommended You Tube as a rich source of inspiration citing Grant Achatz of the Alinea Restaurant and Ryan Clift of the Tippling Club in Singapore as well worth watching. keep it coming, keep it coming! Great write up Janice, I will look forward to the next one. never thought to split mine into separate posts. brilliant writing on a fab day. Quite glad I seem to have avoided being photographed. FABULOUS post, I was offered a ticket too, but could not get back in time....och well, next time! Thanks Vohn! At least it means you don't have to wait for the next installment!